Technical name of a certain class of commentaries, consisting of a number of single, "new" remarks, additions, and explanations in connection with a text and its earlier commentaries. The ḥiddushim commentaries differ from the others ("perushim," "bi'urim") in that they do not form a continuous production, as do the latter, but contribute only "new" remarks upon difficult parts of the text or its commentaries. But this original difference has not always been preserved, and the word "ḥiddushim" has been used as a general designation for commentaries, without regard to their specific character. The ḥiddushim may be divided into the following classes: (1) Ḥiddushim on Biblical books. (2)Ḥiddushim on the Talmud: (a) on its haggadic parts, (b) on its halakic parts. (3) Ḥiddushim on codices. (4)Ḥiddushim on certain rabbinical treatises. 1. The number of ḥiddushim on Biblical books is exceedingly small. Naḥmanides (d. about 1270) was the first to write them on the Pentateuch, his work being entitled "Ḥiddushim bi-Ferushe ha-Torah," or "Ḥiddushe Torah" (before 1480; 2d ed., 1489); he was plainly conscious of the difference between his work and earlier Pentateuch commentaries. In fact, his commentary differs, from preceding ones in that with him it is a question of explaining not single words or grammatical constructions, but the connection between single passages and the whole book; for this reason he places a short, comprehensive table of contents at the beginning of each separate book (see Grätz, "Gesch." 3d ed., vii. 129).Among the Biblical ḥiddushim writers of the seventeenth century may be mentioned: Elhanan Haehndel ("Ḥiddushe Elḥanan," Offenbach, 1722 and 1731), on the Pentateuch and the Earlier Prophets; Gershon Ashkenazi (d. 1694; "Ḥiddushe ha-Gershuni," Frankfort-on-the-Main, 1710), on the Pentateuch (compare Jew. Encyc. iii. 172, s.v. Bible Exegesis). 2. Neither are the ḥiddushim commentaries on the haggadic parts of the Talmud numerous. The first of this kind, "Ḥiddushe Haggadot," on various treatises, was composed by Solomon ibn Adret. Fragments of this have been preserved in Jacob ibn Ḥabib's '"En Ya'aḳob." Solomon wrote this commentary with the purpose of interpreting several objectionable haggadahs and of giving them reasonable meanings (Grätz, "Gesch." 3d ed., vii. 145; Perles, "Salomo ben Adereth," pp. 55, 82, Breslau, 1863).As examples of haggadic commentaries of the seventeenth century may be mentioned those of Moses Dessau, or Moses ben Michael Meseritz, on Berakot, Shabbat, Ḳiddushin (1724), and of Moses ben Isaac Bonem. The latter also contains ḥiddushim on the halakic portions of the Talmud; it was printed together with the "Ḥiddushe Haggadot" (on five Talmudic treatises) of his son-in-law, Samuel Edels (Lublin, 1627). 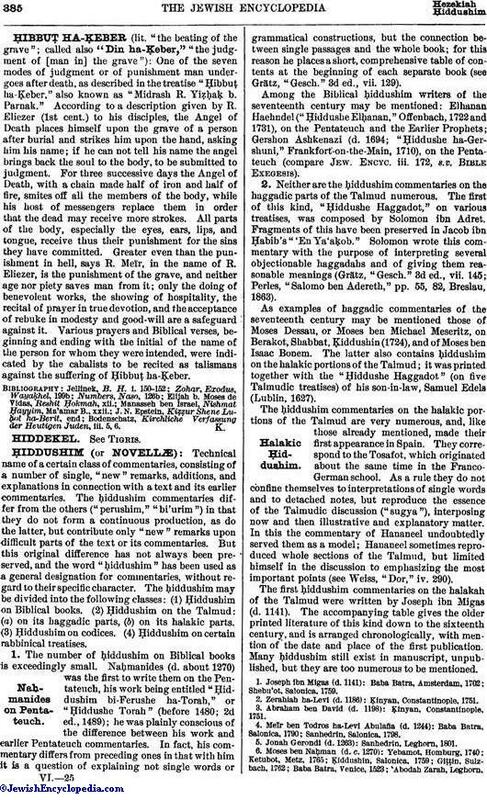 The ḥiddushim commentaries on the halakic portions of the Talmud are very numerous, and, like those already mentioned, made their first appearance in Spain. They correspond to the Tosafot, which originated about the same time in the Franco-German school. As a rule they do not confine themselves to interpretations of single words and to detached notes, but reproduce the essence of the Talmudic discussion ("sugya"), interposing now and then illustrative and explanatory matter. In this the commentary of Hananeel undoubtedly served them as a model; Hananeel sometimes reproduced whole sections of the Talmud, but limited himself in the discussion to emphasizing the most important points (see Weiss, "Dor," iv. 290). The first ḥiddushim commentaries on the halakah of the Talmud were written by Joseph ibn Migas (d. 1141). The accompanying table gives the older printed literature of this kind down to the sixteenth century, and is arranged chronologically, with mention of the date and place of the first publication. Many ḥiddushim still exist in manuscript, unpublished, but they are too numerous to be mentioned. 1. Joseph ibn Migas (d. 1141): Baba Batra, Amsterdam, 1702; Shebu'ot, Salonica, 1759. 2. Zerahiah ha-Levi (d. 1186): Ḳinyan, Constantinople, 1751. 3. Abraham ben David (d. 1198): Ḳinyan, Constantinople, 1751. 4. Meïr ben Todros ha-Levi Abulafla (d. 1244): Baba Batra, Salonica, 1790; Sanhedrin, Salonica, 1798. 5. Jonah Gerondi (d. 1263): Sanhedrin, Leghorn, 1801. 6. Moses ben Naḥman (d. c. 1270): Yebamot, Homburg, 1740; Ketubot, Metz, 1765; Ḳiddushin, Salonica, 1759; Giṭṭin, Sulzbach, 1762; Baba Batra, Venice, 1523; Abodah Zarah, Leghorn,1790; Shebu'ot, Salonica, 1791; Makkot, Leghorn, 1745; Niddah, Sulzbach, 1762. 7. Isaiah di Trani ben Mali (d. about 1270): Ta'anit, Leghorn, 1742. 8. Aaron ha-Levi (d. 1300): Ketubot, Prague, 1822. 9. Solomon ibn Adret (d. 1310): Berakot, Venice, 1523; Shabbat, Constantinople, 1720; Beẓah, Lemberg, 1847; Rosh ha-Shanah, Constantinople, 1720; Megillah, Constantinople, 1720; Yebamot, Constantinople, 1720; Ḳiddushin, Constantinople, 1717; Giṭṭin, Venice, 1723; Nedarim, Constantinople, 1720; Baba Ḳamma, Constantinople, 1720; Shebu'ot, Salonica, 1729; Menaḥot, Warsaw, 1861; Ḥullin, Venice, 1723; Niddah, Altona. 1727. 10. A pupil of Solomon ibn Adret: Ḳiddushin, Venice, 1843. 11. Menahem Meïri of Perpignan (d. 1320); Beẓah, Berlin, 1859. Megillah, Amsterdam, 1769; Nedarim, Leghorn, 1795; Nazir, Leghorn, 1795; Soṭah, Leghorn, 1795. 12. Asher ben Jehiel (d. 1327): Ḳinyan, Constantinople, 1751. 13. Yom-Ṭob ben Abraham Isbili (d. 1350): Shabbat, Salonica, 1806; 'Erubin, Amsterdam, 1729; Mo'ed Ḳaṭan, Amsterdam, 1729; Yoma, Constantinople, 1754; Sukkah, Constantinople, 1720; Ta'anit, Amsterdam, 1729; Megillah, Leghorn, 1772; Yebamot, Leghorn, 1787; Ketubot, Amsterdam, 1729; Ḳiddushin, Berlin, 1715; Giṭṭin, Salonica, 1758; Nedarim, Leghorn, 1795; Baba Meẓi'a, Venice, 1608; Shebu'ot, Leghorn, 1790; Makkot, Sulzbach, 1762; Ḥullin, Prague, 1735; Niddah, Vienna, 1866. 14. Nissim Gerondi (d. c. 1374): Shabbat, Warsaw, 1762; Giṭṭin. Constantinople, 1711; Sanhedrin, Sulzbach, 1762; Shebu'ot, Venice, 1608; Ḥullin, Sulzbach, 1762; Niddah, Venice, 1741; 'Abodah Zarah, Jerusalem, 1903. 15. Josef Ḥabiba (d. 1400): Shebu'ot, Leghorn, 1795. 16. Simon ben Ẓemaḥ Duran (d. 1444): Rosh ha-Shanah, Leghorn, 1745; Ketubot, Leghorn, 1779; Giṭṭin, Fürth, 1779. 17. Isaac Aboab (d. 1492): Beẓah, 1608. 18. David ben Abi Zimra (d. 1573): Sanhedrin, Prague, 1725. 19. "Ḥiddushe Geonim" (anonymously): Baba Ḳamma, Salonica, 1725; Baba Meẓi'a, Salonica, 1725; Sanhedrin, Salonica, 1725. 20. "Ḥiddushim" (anonymously): Ḳiddushin, Constantinople, 1751. 21. "Ha-Ḥiddushim bell Pisḳe Dinim" (anonymously): Ta'anit, Prague, 1810. Toward the end of the fifteenth, and especially after the sixteenth, century, when the Talmud had already been investigated, commentated, and revised in every conceivable way, there arose, particularly in the Polish Talmudic schools, and even among the less capable teachers, the desire to say something "new," to raise questions and answer them, to point out apparent contradictions and harmonize them by pilpul. The introduction of hair-splitting distinctions into the treatment of halakic-Talmudic themes probably originated with Jacob Pollak (see Brüll, "Jahrb." vii. 35). The demand for "novellæ," which every rabbi met from his disciples, produced a large class of such ḥiddushim, too numerous to be mentioned here. Some of the ḥiddushim-writers—e.g., Samuel Edels ("MeHaRSHA"; d. 1631), author of "ḥiddushim" (Basel, sixteenth century), "Ḥiddushe Niddah" (Prague, 1602),"Ḥiddushe Halakot" (Lublin, 1611, 1621), etc. ; Meïr Lublin ("MaHaRaM"; d. 1616), author of "Ḥiddushe Maharam Lublin" (Sulzbach, 1686); Meïr Schiff ("MaHaRaM Schiff"; d. 1641), author of "Ḥiddushe Halakot" (Homburg, 1737); and Solomon Luria ("MaHaRSHaL"; d. 1573), author of "Ḥiddushe Maharshal" (Cracow, 1581), forming mostly a sort of supercommentary to the ḥiddushim of the older generation—are conspicuous for their common sense and critical spirit. Solomon Luria was even distinguished for a certain independence of spirit with which he attacked some of the old authorities, beating out new paths for himself (see Solomon Luria). 3. Ḥiddushim commentaries on the codices, finally, were written by: Jonah Gerondi (d. 1263; on Isaac Alfasi's "Halakot to Berakot"), 1509; Nissim Gerondi (d. c. 1374; on several treatises of the same work), 1509; Nathan Spira, (d. 1633; on the same), 1720; Elijah Mizraḥi (d. 1526; on Moses Coucy's "Sefer ha-Miẓwot"), 1547; Gershon Ashkenazi (d. 1694; on Jacob ben Asher's "Ṭurim," ii.-iv. ), Frankfort-on-the-Main, 1710; Samuel Modigliano (17th cent. ; on Maimonides' "Mishneh Torah"), 1826; Jonathan Eybeschütz (d. 1764; on the same), Berlin, 1799. 4. 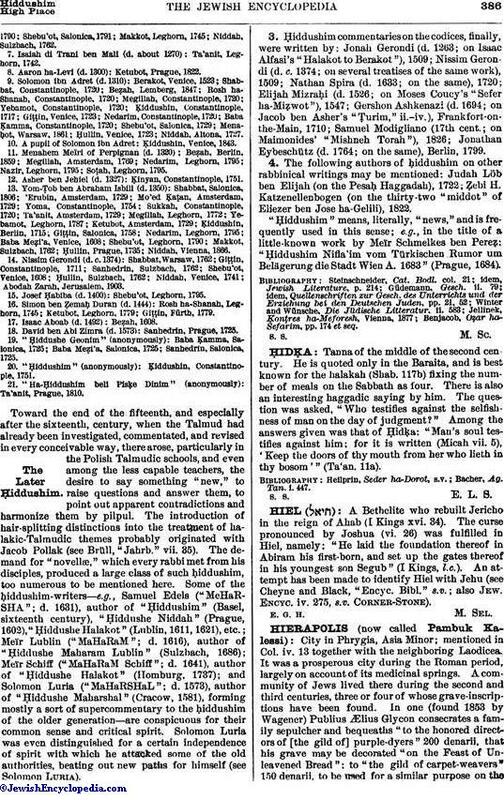 The following authors of ḥiddushim on other rabbinical writings may be mentioned: Judah Löb ben Elijah (on the Pesaḥ Haggadah), 1722; Ẓebi H. Katzenellenbogen (on the thirty-two "middot" of Eliezer ben Jose ha-Gelili), 1822. "Ḥiddushim" means, literally, "news," and is frequently used in this sense; e.g., in the title of a little-known work by Meïr Schmelkes ben Pereẓ: "Ḥiddushim Nifla'im vom Türkischen Rumor um Belägerung die Stadt Wien A. 1683" (Prague, 1684). Benjacob, Oẓar ha-Sefarim, pp. 174 et seq.